Designing a set for a theater production always presents challenges. How will the set pieces help tell the story that the actors are performing? Does the theme of the play demand a minimalist set, or an ornate one? How do you keep 500 square feet of sod and grass alive inside a windowless dark theater? 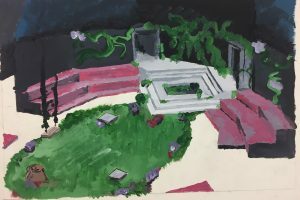 That’s been the challenge for senior drama major Ryan Miller, who has taken on the role of set designer for the senior class’ production of Metamorphoses, written by Mary Zimmerman and based on the poems of Ovid. Artist rendering of the “Metamorphoses” set in Belk Theatre. And it all had to be completed in six weeks. One of the biggest challenges, Miller said, is keeping that real grass green and thriving for opening night. The transformation of the stage fits right into the theme of the play as well, Miller said. You can see how Miller and the crew have made Belk Theatre “beautiful through love” at four performances, Nov. 15-17 at 7:30 p.m. and Nov. 18 at 2:30 p.m. Ticket prices and details can be found at https://drama.unca.edu/theatre-unca.